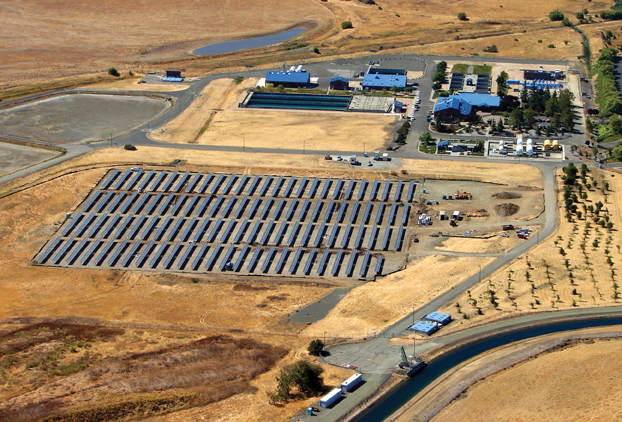 A 1.1 MW solar project in northern California is helping the cash-strapped city of Fairfield achieve green on two fronts: it will generate significant cost savings and allow the city to run its water treatment plant with green energy. More than 4,000 American-made 265-watt SolarWorld modules were installed on the solar project at the North Bay Regional Water Treatment plant. SolarWorld went with a single-axis tracking system from Navarra, Spain-based Grupo Clavijo because of a positive experience with a similar installation in Fresno, California. With power demand that roughly parallels that produced by a mid-sized solar project, water treatment plants are a natural partner for the sun-powered technology. An added attraction is water treatment plants are often surrounded by vacant land, making it easier to site a photovoltaic project. Such was the case with the North Bay Regional Water Treatment Plant operated jointly by Vacaville and Fairfield, California—neighboring cities about 50 miles northeast of San Francisco. A 1.1-megawatt solar PV system built on seven acres adjacent to the plant went online in mid-September and is expected to save the cities about $2 million during the 20-year life of a power purchase agreement. SolarWorld's Camarillo, California-based engineering, procurement, and construction division managed the installation, including design, engineering, procurement, permitting, and construction. The firm also brought in Salt Lake City, Utah-based Sustainable Power Group—also known as sPower—as the financing entity for the PPA. Fairfield, which acted as the lead city on the project, originally put out a request for a proposal about three years ago. But environmental issues surrounding the federally endangered California tiger salamander and possible mitigation delayed it for more than a year, said Raju Yenamandra, SolarWorld's vice president of business development. The amphibian is also listed as threatened under the California Endangered Species Act. Tiger salamanders reproduce in seasonal rain-fed vernal pools and spend much of their lives underground in burrows vacated by other animals in the state's grasslands and oak woodlands. As part of a biological review, land in 19 northern California counties, including Solano County where the solar project was proposed, had been designated critical habitat. To obtain the necessary permits, Fairfield had to agree to preserve salamander habitat at the Elsie Gridley Mitigation Bank south of the town of Dixon at an estimated cost of $240,000. Since Vacaville also gets water from the North Bay Regional Water Treatment plant, it will pay one-third of the habitat cost. Fairfield's share of the cost will come from water bills and not the general fund. "There were no tiger salamanders that were ever seen on the site—it was just identified as a potential habitat," said Josh Corbin, SolarPower project manager. "We never saw a tiger salamander, but we did have to take additional mitigation measures based on a biological review." Among those measures were having a biologist visit the site during construction and excluding several areas of the site from any construction activity. Because of the elapsed time from the first RFP, Fairfield put out a second RFP in the fall of 2011, and the project was eventually awarded to SolarWorld. Although the lending environment has improved a bit since the economic downturn, Corbin said lenders are still guarded. "I think they are generally cautious, no question," he said. "They look at the credit rating of the entity because when you're putting something in the ground that has a life of 30 years and it has a long-term PPA, you have to look at the entity and whether they can pay the bills." Like many cities in California's Central Valley, Fairfield has suffered from high rates of residential foreclosures and property devaluations with accompanying decreases in property tax revenue during the past five years. In August 2012, Standard & Poor's Ratings Services revised its outlook to negative from stable on debt issued for Fairfield, citing the city's projected deficit without the approval of a local sales tax increase. "Generally, cities or state agencies are pretty well received by the investment community. In this particular case, the city's [Fairfield's] finances are not that strong. But the solar system is saving the cities money by lowering their operating expenses. So it doesn't really impact the cities' ability to pay because they are paying from the operational savings," Corbin said. Under the PPA, sPower will own and operate the PV system. For the life of the 20-year agreement, Fairfield and Vacaville will be the exclusive customers and will purchase all of the energy generated at 10.5 cents per kilowatt hour. Initially, this is the same rate charged by Pacific Gas & Electric Co., the local utility. As electric rates rise, though, the cities are expected to save between $1 million and $3 million over the life of the agreement. The energy will be used to run the water treatment plant. sPower will also retain the solar renewable energy credits, which are essentially worthless at the moment because a market has not yet been developed in California for trading the SRECs, Yenamandra said. SolarWorld went with a size of 1.1 MW because that is the largest system you can build and still participate in net metering, Corbin said. It also used standard interconnections. If the project were larger, SolarWorld would have to obtain special interconnection agreements. The firm had installed a similarly sized system in 2006 for the El Dorado Irrigation District's water treatment plant near El Dorado Hills, California. Although the North Bay Regional Water Treatment Plant uses all of the power produced, the system had to be grid connected to reap any tax advantages, Yenamandra said. SolarWorld designed the system around a single-axis tracking system to maximum energy generation. "The advantage, especially in California, is you get about 20 percent more energy than a fixed system, and the incremental cost of the tracker is much less," he said. "It's a benefit from a cost-benefit perspective, so you're better off with a single-axis tracker." The site is about two miles from Travis Air Force Base in Fairfield, but Yenamandra said the firm didn't have to undergo Federal Aviation Administration review of possible glare from the modules. He cited a PV system installed about 10 years ago atop a UPS facility adjacent to the Palm Springs, California, airport as one that did need FAA approval. "That was one of the few right adjacent to an airport, so we went through an FAA approval process for putting modules on the top of the building," he said. "But this one is a distance away from the airfield, so we didn't see any real issues with it at all." Because of the vacant land around the water treatment facility, Corbin said materials could be staged on site, "so it worked out pretty well." The seven-acre site required only minimum grading and preparation before the pier driving began in May. The site had fairly uniform soil types without any real rocky areas, according to soil sample results. The lack of wide variation also translated into minimal differences in the pier driving depth. Overall, about 700 piers were sunk. At the same time, laying of underground power lines began to interconnect the collection system. Installation of the tracking systems as well as more than 4,000 265-watt American-made SolarWorld modules followed. SolarWorld went with a single-axis tracking system from Navarra, Spain-based Grupo Clavijo because of experiences with a similar installation in Fresno, California. "They had already been in operation, and they proved to be a reliable tracker," Corbin said. "The city [of Fairfield] felt they wanted a tracker that had proven experience." In the U.S., Grupo Clavijo is represented by MGK Solar, a subsidiary of Miller Welding & Machine Co. of western Pennsylvania. The Fairfield project also included two 500-kW inverters from Advanced Energy Industries Inc., of Fort Collins, Colorado. "Cost is always a consideration, but Advanced Energy has a decent amount of market share and is a company with a proven track record," Corbin said. SolarWorld used Carmichael, California-based System 3 Inc. for electrical contracting work, based on prior projects the two had worked on together. "We did the engineering and supply on two other projects, and they did the construction, so we had a history," Yenamandra said. "They were our customer for a couple of similar jobs, and in this case, we were the prime and they were the subcontractor. They have a very good reputation." SolarWorld relied on System 3 to obtain the necessary labor. Because of the number of solar installations that had been completed in Northern California, finding experienced workers wasn't a problem, he said. Once the installation was completed, SolarWorld began testing to make sure the system performed as expected. "The project was well planned and went off without too many hitches," Corbin said. Although sPower will maintain the system, Corbin said SolarWorld can still monitor system performance. "Everything is working quite well," he said. Felix Riesenberg, Fairfield's assistant director of public works, said the solar project will help the city achieve its goal of reducing overall energy costs while keeping operating costs down. "This is yet another example of the Fairfield water utility being innovative to reduce operational costs and to minimize future rate increases," he said. Vacaville's interim assistant director of utilities, Steve Sawyer, agreed. "Vacaville has a long history of embracing solar and alternative energy projects as a way to save money and protect the environment, and this one fits nicely with that approach," says Sawyer.